If you are a regular at the rddreams forum you would have seen a very regular scene - Disussions on bullets turning into hot fights. This is a strange bike - People either love it or just downright hate it. Hard to find people in between. Its a sort of machine with that sort of character that raises extreme emotions in everyone. 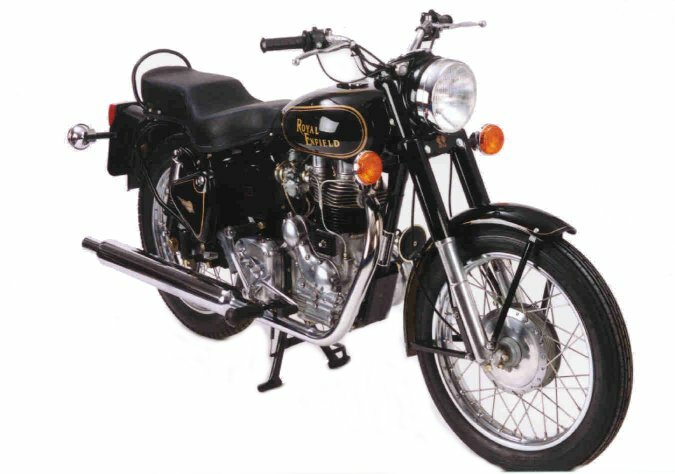 Everything from the looks to the exhaust note to the throttle response, the Enfield Bullet has a personality of its own. And very few people get their impressions changed; Because people who dont like the bullet, never ever bother to even touch it, let alone ride. And hardly do other bikers come upon a pretty aggressive bullet rider for the simple reason that they are pretty rare. The point im driving at is that if you are a pulsar or cbz rider who happen to mock bullets and be unfortunate enough to cross paths with such a guy on a bullet, you will go home with a crushed ego and vivid images of that 'sluggish oaf' whipping past you at 110 plus speeds while your 'superbike' struggles to 100. Quite contrary to public belief, The Bullet moves. Maybe yes, its not good at popping a wheelie and taking off like a slingshot from traffic, but dont forget that there are speeds above 60. Thats when the bullet begins to climb the ladder, real quick. Always used to wonder what is it abt the bullet that gets it such a loyal fan following, such die-hards. Its not just that 18bhp or 22bhp or whatever, neither is it just that thumping sound. Of course you will say its a combination of all, but whats it thats more fundamental. Some time back i had my first ride on the bullet. I have to admit i walked away with tremendous admiration for the machine. There was something abt that bike which i couldnt put my finger on, something that made it a complex special character. The bullet is not a simple machine mechanically - its quite complex. The very look of the bike provides that feeling. When you follow the rituals of getting the bike off the center stand and starting the bike via those wierd ways, this feeling deepens; That this is not just another simple bike. Once the bike fires up with its characteristic thumping note, the feeling solidifies. In short, right from the moment you see the bike to starting it to rolling it off, the bullet forms in your mind an image of an intricate personality with a complex and highly respectable character. The more i think, the more i tend to latch on a particular character trait; A total lack of stress. That day when i rode the bullet, the single most striking factor was a total lack of stress from the whole machine. Now this is a subtle point - This is the one which is all about respect. A bike can respond in different ways to what you do. Whip open the throttle, and a bike may or may not respond. It may respond with a high pitch scream and surge ahead; Or there might be only the scream but no surge etc. Its as if you are telling the bike 'bugger show me 120kmphr' and the bike may tell you 'yeah fine just a sec i'll fry my engine out and show you that right now' or 'im trying im trying but just not reaching'. The bullet is different - there is a total lack of stress or hurry or struggle of any sort and when you wind open the throttle the bike is not flustered the least and it calmly starts accelerating steadily towards that speed and its as if the bike is telling you 'have patience old boy, all in good time '. And it does show you a rock solid 120kmphr. Everything about the bullet fits snuggly into its character; Never seems to be a time when you find the bike helpless and sweating - even when it sends up strong vibes, they blend in with the bikes nature and fits into the scene totally.